When planning a camping trip with the family, by far one of the most important decisions will be the sleeping arrangements. Unless you are bringing a campervan, this likely means that you will need to figure out which tent, or tents, you will need for your circumstances. There are a wide variety of different tents each suited for different purposes. Here we present a list of the 7 key features to look for when choosing a camping tent. This list takes the bird’s eye approach, identifying major characteristics and what camping circumstances they best serve. 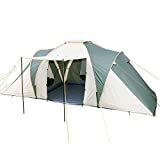 Depending on when and where you intend to camp, there are numerous ratings of tents designed to be suited for different situations and settings. This is generally based on the temperature of the location but it will also be applied to some other weather conditions once you begin to get to the extremes of weather. In essence, there are 4 general categories which are commonly applied to tents based on seasons–though the final entry does extend beyond the seasonal approach. The first 3 classes are Summer tents, Three-Season tents, and Four-Season tents and can be used in virtually any environment for which they are rated which increases with the number of seasons. The last category of tent is often called the Mountaineering tent which is, as the name implies, meant to be used when climbing mountains; but can also apply to extreme, cold-weather climates. You can use a three and four-season tent during the summer, but the summer tent is not going to be appropriate in spring, autumn, and winter weather. Likewise, a three-season tent will not be designed to handle the potentially freezing temperatures which often accompany true winter conditions. That said, the rating of a tent is often determined by a combination of the other aspects and qualities on our list. This decision will often impact how heavy the tent is–which is more an issue with humidity and ventilation than anything else. However, the weight of the material will also often impact the durability of the tent’s walls. While construction will also play an important role in the tent’s overall durability, the material is arguably what will face the most general abuse. In this case, there are 4 common materials used with the differences being more about a preference of aspect as opposed to an absolute superiority. The exception to this is similar to the rating system in that the material used for the most extreme, cold-weather tents–namely Gore-Tex–which is universally superior to the other 3 common materials–which are polyester, nylon, and canvas–in virtually every way. That said, not everyone is willing to spend the money for a Gore-Tex tent–especially one large enough for a family. As such, one of the other 3 materials is more likely to be found–with polyester and nylon being more common than canvas. Polyester and nylon are similar in many respects, but nylon is a bit more durable while polyester is a bit more naturally water-resistant. Canvas is the most durable material, but it is not natural water-resistant and must be retreated regularly. Canvas is also generally more expensive than the synthetic fibres as well as heavier and less breathable–though it does offer significantly more insulation and protection from the wind. The construction of a tent refers to how the tent stands upright and how the different panels are connected. 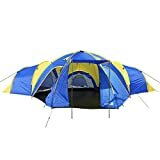 This will generally impact the ease of setting up the tent and breaking it down as well as how well it can resist water. In fact, so long as the materials have been treated such that they are 100 percent waterproof, the construction becomes the next most likely cause of water getting into a tent. It should be noted that the supports for the tent will not generally impact how watertight the tent is unless it introduces some fatal flaw–for instance, should the supports create even a small place in the center of the roof for water to gather, it is only a matter of time before that water works its way into the tent. That said, the method of support will often impact how well the tent stands up to wind as well as how well it can handle destabilising force from within. When it comes to the waterproofing of the tent, the construction refers primarily to the seams and the floor–which is primarily affected based on the placement of the seams. For the floor, which is arguably the most important part and most difficult to get right, look for a “bathtub” construction. This is both the most durable as well as the most inherently waterproof. For the walls, you will want to look for double, or even triple, seam tents that have an internal taping or another secondary sealing process. The design of your tent begins the first of many qualities which, while meaningful, are not likely to impact the functional viability of the tent. In this instance, the design will determine how space is apportioned as well as influence the structural integrity. It should be noted that the structural integrity of the design is split between its ability to withstand external force–primarily in the form of wind–as well as its ability to manage internal destabilisation from people moving. Of course, as should be expected, there is a top-tier design which is used for the high-end tents which is the best in virtually every way and this is the geodesic design. This design provides not only the most usable space – though is usually reserved for single-person tents – but it offers the best protection against the wind and rain while offering superb internal stability. The other designs are numerous, but they often function from either a circular or angular principle. A-Frame and Cabin tents make up the majority of the angular designs, with Cabin tents being the most popular of the group–and is arguably the most popular altogether. The circular designs are headlined by Dome and Tunnel styles that are arguably better than the angular designs but are more difficult to make larger than average. Thankfully, some companies have seen the light and offer larger tents with hybrid designs to take full advantage of each geometry’s benefits as suits the situation. Ventilation is strictly a comfort quality, but in terms of determining the quality of your overall experience, this is easily one of the most important factors to consider. While ventilation is especially important for settings which are already humid or hot-weather climates, it will still ultimately have such an out sized impact on the quality of your experience that you must prioritise it above bells and whistles. Unfortunately, at least half of the ventilation is determined by more fundamental qualities like the material or rating, meaning there may be little you can do depending on the circumstances. If you live in a region with hot summers and cold winters, you may very well need to get 2 different tents. That said, there are plenty of ways that tent manufacturers can improve the ventilation of even the thickest, heaviest tents. One of the most common is to have strategically placed mesh as well as subtle design features meant to force air circulation even in stagnant conditions. Still, mesh ventilation can only help so much if the setting itself is somewhat miserable, and even a relatively open enclosure is still enclosed. As such, it might not actually be a bad idea to opt for the more expensive convertible tents which can shed panels or layers to transform from a four-season tent into a Summer tent. Based on the previous categories discussed, this is a natural outreach of design–especially once you begin to make tents for entire families. Whilst not universally true, tents with compartments are often some of the larger within their class and can be quite extensive in terms of setup. The reason you would put up with the inconvenience is that this arrangement can provide some sense of privacy and normalcy while retaining the vital quality of camping. Generally, compartments can be simple or complex, but they generally revolve around the idea of offering separate spaces for either different people or different purposes. While storage compartments can technically be included in this category, they are so inconsequential to the overall experience – especially in comparison to the division of space – that they should be considered tertiary influences at best. How that principle is expressed in practice can vary greatly such that the same tent could conceivably be divided into halves, quarters, or some other arrangement. In fact, some of the more ‘progressive’ tent models offer a modular design which allows you to put up and take down inner panels of different types – like having a mesh window or a zipper panel – depending on what arrangement best suits your needs. Of course, this is generally reserved for the most expensive models, so it is more likely a decision to compromise. 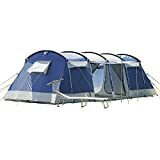 There are also some tents which offer a quasi-compartment with a mesh “porch” area, but these are not quite as versatile. When it comes right down to it, this is pure fluff as whether or not your tent is integrated to support electrical use or not will have little bearing on its ability to functionally serve as a comfortable shelter. That said, out of all the different features which are purely for convenience’s sake, the ability to use electricity if you desire is by far the most valuable and the most versatile. Keep in mind, just because your tent is integrated with electrical infrastructure does not mean that you have to use it to its fullest capacity. Simply having the ability to use certain appliances or tools can be a worthy use for electricity out in the field. There are different degrees to which this occurs, primarily based on how integrated the infrastructure actually is. For instance, it is not too terribly uncommon for a mid-tier tent to include some form of opening to allow entrance for electrical cords – used primarily for portable generators or something similar. Far less common, and far more expensive, are the tents which actually have wiring and outlets spaced throughout the structure which simply requires a power source–with deep cycle batteries often sufficing–to serve as a hub of sorts for powering electrical devices. When choosing a tent to take your family camping, the size is arguably the unspoken factor. Always make sure to get a tent which can fit 2 more adults than you expect to have people for normal comfort. This list does still serve as a good way to identify what it is you need out of a tent and in what order these different qualities should be prioritised. 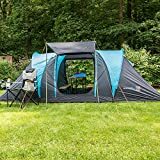 A family of 3 living in Southern England will require a significantly different tent than a family of 6 living in Scotland. Still, with a little planning and consideration of your circumstances, you will be able to figure out how to choose a great camping tent for your family. For more tips on camping and outdoorsmanship in general, check out the beginner’s camping guide from Survivor’s Fortress.